Amalia draws from a vast bank of experience and wisdom to assist you in getting back on track with the inherent vitality and aliveness of your body. She will help you get unstuck, more focused and grounded in your body, enabling you to feel calm, connected and more in charge of your life. Relax, unwind and surrender into your body’s wisdom through deep muscle release. With a blend of conscious presence and intuitive guidance, I draw upon a broad range of healing techniques including deep tissue work, neuro-muscular stretching, reiki healing, and chakra clearing with a strong emphasis on the breath for the restoration and reintegration of your body’s wellbeing. Amalia sources energy from the above (heavenly) and below (Mother Earth) to ground and balance your energy. She harnesses divine light and sends the current of this energy into the body to unwind and heal blockages. She has the ability to listen to your body and to retrieve messages from your body wisdom and integrates the information in your healing experience. She also utilizes Shamanic clearing, Reiki energy, sound healing and Body Soma Tuning Forks to clear and balance the chakras that need activating. 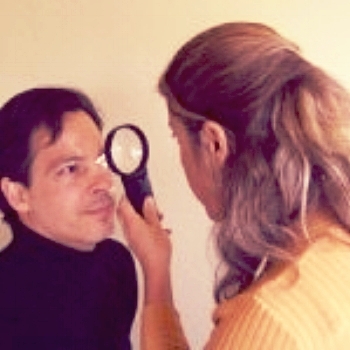 “Maintaining a healthy body is the integral foundation of your spiritual experience.”This is an informative analysis of your health through reading the Iris, (the colored portion of the eye and its markings), to determine the causations of imbalances of nutritional and mineral deficiencies of your body’s health concerns. A clear understanding of what is causing your health concern and how to correct it. A mineral chart for nutritional and mineral deficiencies. Relieve the body’s tension, and improve your body’s health. Experience a deep massage of the reflex points of the feet, to stimulate, balance and regenerate the correlative organs, the areas of the body and increase chi flow. By breaking up and dissolving the build up of toxic crystal aggregates which accumulate in the feet, optimum blood and nerve flow can be restored to the body for regeneration and rejuvenation. You will leave feeling grounded yet on top of the world.